I'm assigning you some homework this weekend. 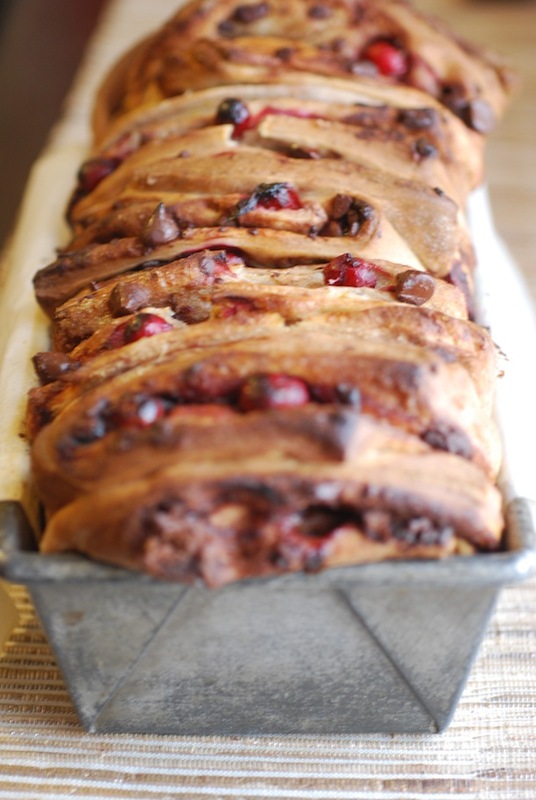 Grab a piece of paper and jot down the ingredients, because you are making this Cranberry Chocolate Chip Spice Pull-Apart Bread this weekend. I'm pushing you to try this one because it's good and it is fun, and the sense of accomplishment you feel when you pull out a loaf of homemade bread from the oven is like none other. Never worked with yeast before? I firmly believe in trying new things (especially new things that scare you) on a regular basis. Gave up carbs for January? I actually did, too! Bake the bread anyway and invite friends over to enjoy it with a mug of tea. Or give it your pastor on Sunday. Or your hairstylist. Or your kid's football coach. Make it and gift it to someone; you'll feel accomplished and make somebody smile. Heck! You can even pull a Young Married Chic, and leave it with the receptionist at your gym (so evil!). I served a few slices of my loaf to a group of friends and then sent the rest of it to work with my husband (where he proceeded to NOT share it because he "wanted to eat it all himself"). Now that I have you convinced, let's talk a bit more about pull-apart bread. If you've never tried it before, it's essentially a yeasted bread dough that is rolled out, cut into multiple squares, stacked like a deck of cards, turned over sideways into a baking pan, and baked that way so that the resulting loaf looks like a crazy accordion of delicious. The name comes from the fact that you can just pull off each slice to eat it. No knives required. It's literally the best thing since sliced bread. White chocolate chips and blueberries and lemon zest. Maybe even a dash of almond extract. Or rum-soaked raisins, pecans, cinnamon and nutmeg. Oooh...or how about caramelized onions, bacon, and fontina? It's a major crowd-pleaser--something about encouraging people to get in there and tear at the bread that always seems to get everyone excited. This particular version is both tart and sweet thanks to the mix of fresh cranberries and semi-sweet chocolate chips. After the protein shakes and hummus I've been throwing at you this week, I figured it was time I offered up something a bit more decadent and this most certainly fits the bill. P.S. I actually made this a vegan pull-apart bread recipe since one of the friends who came over is vegan. Just use almond or coconut milk instead of the regular milk. P.P.S. While the end result looks crazy complicated, it actually only takes about 2 1/2 hours to make, with only about 15 minutes of those requiring you to actually do stuff (the rest is just rising and baking). When Eugene came home to find this on my counter after a busy day he asked, "How did you have the time to make that?" Prepare a baking pan by greasing with oil and lining with parchment paper sot hat it overhangs. Whisk together the yeast, milk, and sugar in the base of your electric mixer and let sit 5 minutes. Add the flour, oil, cinnamon, orange zest, cardamom, and salt, and use the dough hook to combine and knead for 5 minutes until the dough is smooth and not sticky. If the dough is too dry, add a splash of milk. If too wet, add a sprinkle of flour. Form the dough into a ball and place in a greased bowl; cover with plastic wrap and let rise 1 hour or until doubled in size. Once the dough completes its rise, dust flour on the counter and turn out the dough. Roll into a large rectangle, about 1/2" thick. Drizzle the bread with oil and use a pastry brush or your hands to spread it so it completely covers the bread. Scatter the cranberries and chocolate chips over the entire square. Fold the bottom half of the dough towards the center, then fold the top over the bottom two folds so that it forms one long rectangle. Use a pastry cutter to slice the package of dough lengthwise and then again vertically every 2-3 inches so you have multiple squares about the size of a deck of cards. Stack these on top of each other and lay them into the prepared baking pan. Cover loosely with plastic wrap and let rise again for 30 minutes. Place in a preheated 350 degree oven and bake for 45 minutes until puffed up high and dark golden brown. Let cool in pan for 20 minutes, then lift out gently with the parchment paper and serve warm. Keep leftovers, loosely wrapped at room temperature for up to 2 days.